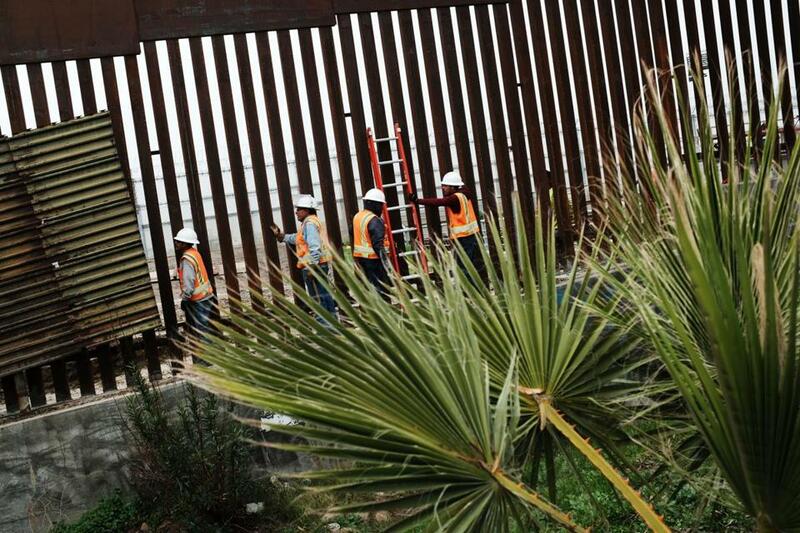 Mexican work crews make repairs to the border fence on Jan. 17, 2019, in Tijuana, Mexico. A time may soon come when President Trump, House Speaker Nancy Pelosi, and Senate minority leader Chuck Schumer all see more value in reopening the federal government than in scoring a clear-cut political victory. But what would a government-opening solution look like? Unless one side completely capitulates, it has to give each something they can plausibly point to as an accomplishment. When the battle of wills is framed as wall versus no wall, it’s hard to see how that works out. One reader, a self-identified independent who asks that his name not be used, has a creative suggestion: If the matter is politically unresolvable at the federal level, why not kick it down to the border states? The federal government could fund a border-security program that would include several billion dollars for a barrier — if those states choose to pursue that strategy. The states, however, would have to put up some funding of their own. Let’s say it was a 75-25 funding split. That would mean the states would be getting a good deal, but not a total federal freebie; they’d have to put up enough of their own money that they’d likely look askance on any plan judged to be ineffective money-squandering. Such a plan would also transfer the decision and the difficulties to the people most aware of the challenges of their localities and terrain. It would certainly make for some interesting politics in Texas, where the idea of a wall isn’t popular, particularly not with ranchers whose cattle need watering access to the Rio Grande. If federal wall/barrier funding ever comes, those siting issues will have to be confronted; who better to make those decisions than state and local actors? Each side would get some face-saving cover, though at the cost of some concessions. Under such an arrangement, Trump could plausibly say that he had secured funding for a border wall or barrier, if the border states decide to go that route. If they don’t — something we wouldn’t know for some period — that would stand as a tacit rebuke to the president. The Democrats could say, with equal plausibility, that they hadn’t signed on to Trump’s wall, but rather had left that decision to the states, where it would be made on more rational criteria than the president’s need to deliver on a campaign pledge he repeatedly promised Mexico would fund. But in action if not in words, Speaker Nancy Pelosi would have to acknowledge that a border wall isn’t ipso facto immoral, as she has suggested. Such a plan would no doubt need lots of legal and legislative work. But that basic outline would give both sides a way around the impasse. And if Trump, Pelosi, and Schumer weren’t willing to arrive at that modus vivendi of their own accord? Well, it’s an idea that might prove acceptable to the Senate “gang” now trying to find a workable solution. And if so, it could become the basis for a congressionally proposed and negotiated compromise. The need for a solution will become more urgent as the effects of the shutdown are felt more widely. And from important services that are no longer provided to a broader effect on the economy to a tightening financial vice on government employees and contractors, they will be. This is the kind of creativity that comes of thinking that is based on solving a problem and not just scoring a political win. So my thanks to a certain reader and concerned citizen for sharing it.